All holidays are the best, but Thanksgiving is the extra-best, because it doesn’t offend anyone other than the killjoys who are put off by naked gluttony. There’s no religious component to fake, work around, or disagree with; the weather isn’t quite horrific yet in most parts of the country; and if you’re in the right industry, you can make a five-day weekend out of it. As for potential family strife of the sort Vox and them keep threatening us with: Just what kind of monsters are those people related to? And even if every last one of your uncles really is an incorrigible bigot or a Cowboys fan or whatever, you’re a grownup now. Avoid them! No law says you have to spend the entire day clashing with people you don’t like. There are only two things that make adulthood preferable to teenagerhood: You’re old enough to make your own social choices and buy your own beer. So welcome to Drunkspin’s official guide to doing both this Thanksgiving. As for the social aspect, here’s our time-tested, foolproof strategy: Don’t engage with assholes. As for the beer part, I recommend picking a flavorful workhorse to get you through the day, something with enough verve to mark a special occasion but not so bold as to take over the whole show. Now, a confession: I’m not always super-duper sold on the importance of carefully pairing your drinks with your eats. I generally find that if you put a cup of good liquid next to a plate of good solid, you’re going to have a fine time regardless of their specific points of compatibility. I’ve had great recent success with matching champagne to a banana, barrel-aged stout to deviled eggs, gose to a 7-Eleven chicken burrito, and bourbon to yogurt. It doesn’t have to be complicated. But that said, if you’re going to go through the effort of building an entire day around eating and drinking, it makes sense to consider the interplay of the flavors, and most beer-pairing scientists these days seem to recommend farmhouse-style ales such as biere de garde or saison for Thanksgiving. Sure! Hey, quick sidestep: What are you guys eating? I’m going to make turkey meatballs with stuffing mix and rosemary and sage and celery and shallots and stuff like that, serve ’em on a big pile of mashed parsnips, and oh, man, it’s going to be great. That’s lunch. Then come sundown, I’m going to a friends’s place for smoked turkey and apple pie. Hot damn! I will be drinking saison all day, probably Allagash and maybe DuPont, because they are both excellent beers, and also because of the ongoing travesty of Surly refusing to distribute to my state. That means I can’t have their outstanding saison CynicAle this Thanksgiving, but I lucked into some a few months ago, and I took notes. 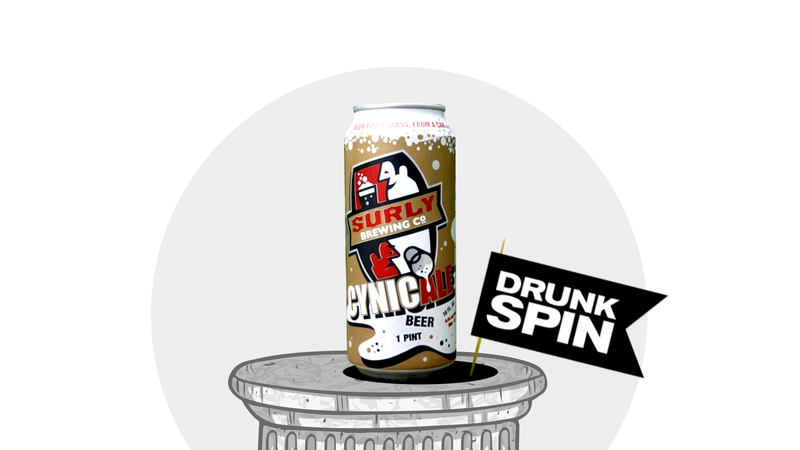 At 6.7-percent alcohol-by-volume, CynicAle sits perfectly in the sweet spot between “Hey, it’s a holiday!” and “I started drinking at 10:30 a.m. and hope to be upright come pie time.” I’m not trying to call a 6.7-percenter a session beer, but, you know, it’s not that strong. Go ahead, have a few. The first thing you’ll notice about this beer is that it is a very pretty golden orange color with a bit of haze and a lot of bubbles. The aroma features citrus and black pepper along with tropical fruit and Belgian yeast esters. The flavor turns slightly sweet, with a bit of brown sugar and ripe peach mid-palate before a resolutely earthy note emerges on the dry finish. Surly CynicAle is assertive enough to liven up the duller parts of the meal but not so busy as to overshadow the good stuff, making it the perfect beer to ease you through the longest, best day of the year.